Have you ever wondered what it’s like to breath underwater? The Discover SCUBA program allows you to experience the thrill of diving without all the work. It’s a half day program where you’ll learn some basic concepts, skills, and SCUBA equipment use before heading off on an open water dive. Prior to your underwater experience the student will meet with their instructor to be outfitted in their dive equipment and learn the necessary safety information before the dive. Then it’s off to the Mongoose for your first SCUBA diving experience. 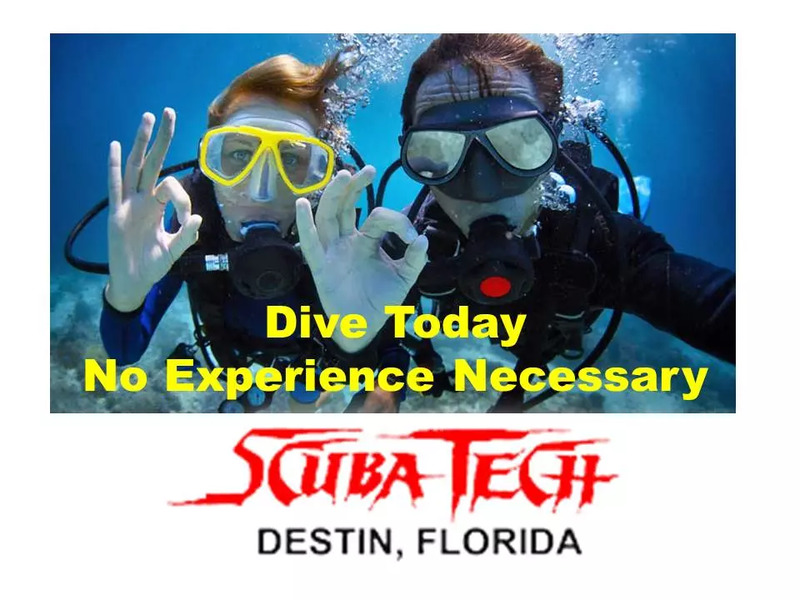 Once onsite at the shallow, protected water of the Destin Jetties, you will don your SCUBA equipment, and our instructors will guide you through the necessary skills to safely participate in your SCUBA experience. Then you get to head out, untethered, to a maximum depth of 40 feet or less and enjoy your first real dive by exploring the underwater world surrounded the Jetties and see all the marine life that calls this place home. The best part, other than the diving of course, is you can use this open water dive towards getting certified to be a full blown SCUBA diver! Try PADI’s eLearning Open Water Diver program and become certified today. You already have one dive under your belt, don’t stop now! Must be in good physical health to participate. Any YES answers on the medical questionnaire (link below) must be approved by a physician. Anyone participating in diving activities are required to be comfortable in the water and know how to swim. Reservations should be made in advance as space is limited. Minimum 24 hour cancellation policy for a refund. There will be no refunds when you check in and find you have a yes answer on the medical form. Anyone diving, MUST look at the medical BEFORE signing up.